Who is the Prosthetic Pastor? 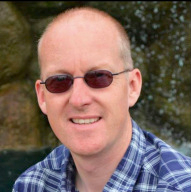 He is Pastor Ross Dilnot, Senior Church Leader of Shenley Christian Fellowship. He was given this nickname after a tragic accident in 2016. Ross had bought a Trike, a three-wheeled motorbike, and on his first ride out on it he lost control and collided with a speed sign post, severely damaging his right leg and leaving him with life-threatening injuries. He was flown to the John Radcliffe Hospital in Oxford, by the Thames Valley Air Ambulance, where he underwent three major operations. These resulted in him having his right leg amputated above the knee and subsequently being fitted with a micro-processor prosthetic leg … hence the title Prosthetic Pastor! The following audio link tells his story about what happened that tragic day. You can also follow his adventures through the Prosthetic Pastor Facebook page. Copyright © 2019 Shenley Christian Fellowship. All rights reserved.